Moselio Schaechter at Small Things Considered recently posted a nice overview of the change our understanding of the microbial world has undergone over the past 30 years. Recognition of the role microorganism play in all living systems has had profound impacts on many scientific disciplines. The central message of the post is that, until recently, the vast amount of bacterial biomass on the earth went unnoticed by modern science. 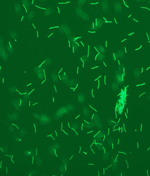 This changed with the use of new techniques to estimated bacterial abundance. These techniques estimated cell numbers by direct counts. The traditional methods required growing bacteria to establish their presence. Since many bacteria do not grow under standard laboratory conditions, culture based approaches underestimate abundance. As more and more environments were surveyed for bacteria, estimates of the number of bacterial on the planet rose from around 1020 cells, to the current value of over 1030. 1030 is one thousand, billion, billion, billion cells. It is an enormous number. As Schaechter points out in his essay, there are more prokaryotic cells on this planet than there are stars in the sky. The number is so large that, despite the small size of each cell, these microbes account for about half of all living biomass on Earth. Not only does prokaryotic biomass equal the biomass of all other organisms combined, microorganisms dominate life’s evolutionary and metabolic diversity. It is truly a microbial world. Consider our own bodies. Most people are vaguely aware that our skin and guts harbor bacteria, but they don’t always appreciate just how many bacteria we host. Our bodies are teaming with bacteria. There are so many, that bacterial cells out numbered our own cells by a factor of 10 to 1. Think about that. When you get up and walk across a room, you are transporting ten times more bacterial cells than human cells. The recognition of the abundance and diversity of bacteria we all host is driving new lines of research into the role bacteria play in our health and well being. Given the sheer number of bacterial cells we harbor, one could argue that we’ve evolved as moving containers for bacteria. Our purpose is to move our bacteria around, help them obtain food, grow and multiply.